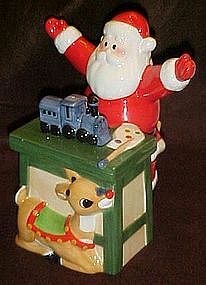 Gorgeous Rudolph The Red-Nosed Reindeer & SantaCovered Candy Jar by Lenox in New & Unused Condition. Add this beautiful candy dish to your collection today!Lenox "Rudolph The Red-Nosed Reindeer covered candy dish. Features Rudolph hiding from Santa behind a green work bench. Porcelain. Candy Dish is 9 inches tall, 7 inches wide side to side and 6 inches front to back. 2002.